Or maybe you've tweaked your back once or twice in the past and it heals on it's own, but you'd like to prevent tweaking it in the future and particularly prevent it becoming a chronic injury. 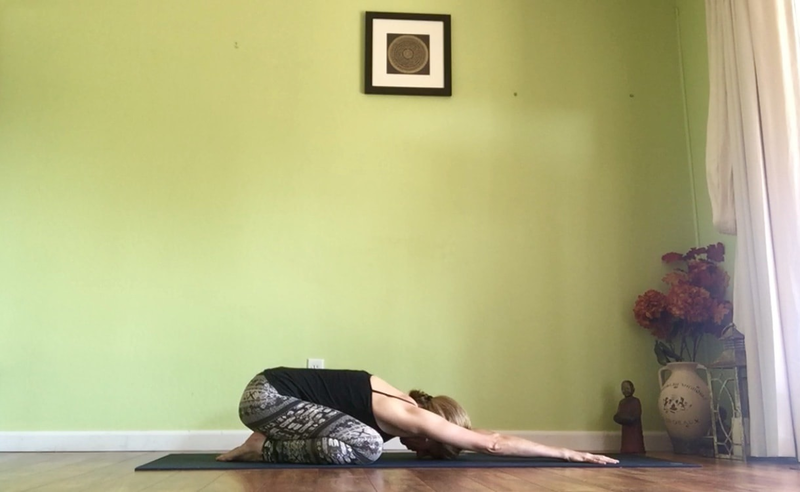 Many of my clients have asked me about yoga poses for low back pain so I thought it would be helpful to share a quick list of helpful poses, with descriptions and photos. Here are my favorite yoga poses that will help to ease low back pain and get you back on track with your life, feeling pain free and flexible. I recommend beginning this sequence, using the breathing as noted below, and then progress to holding each pose for longer, up to twice the number of breaths noted below. Always listen to your body and remember to breathe deeply and slowly. 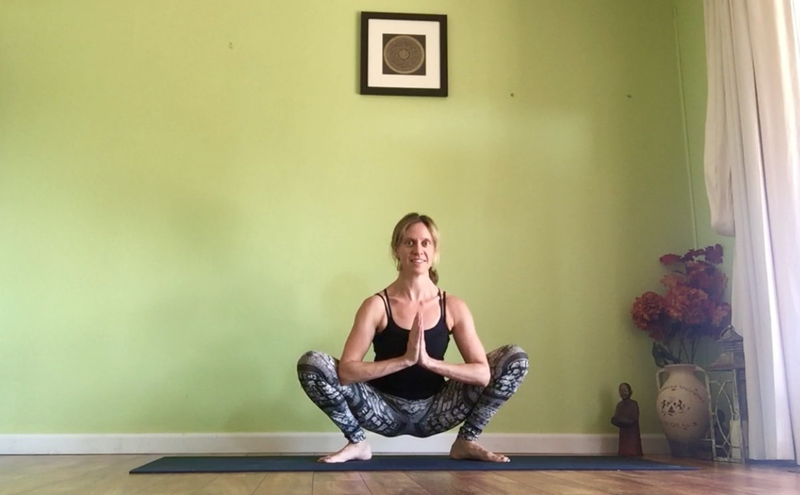 If any pose doesn't feel good or you are experiencing discomfort or pain, please release out of the pose and leave a comment or question in the comments section below and I will be sure to respond. Begin on your hands and knees, with your shoulders directly over your wrists, fingers spread wide, and your hips directly over your knees. Take a deep inhale as you lift the tailbone, roll through the spine one vertebrae at a time, and gaze up, arching the back, into Cow Pose. 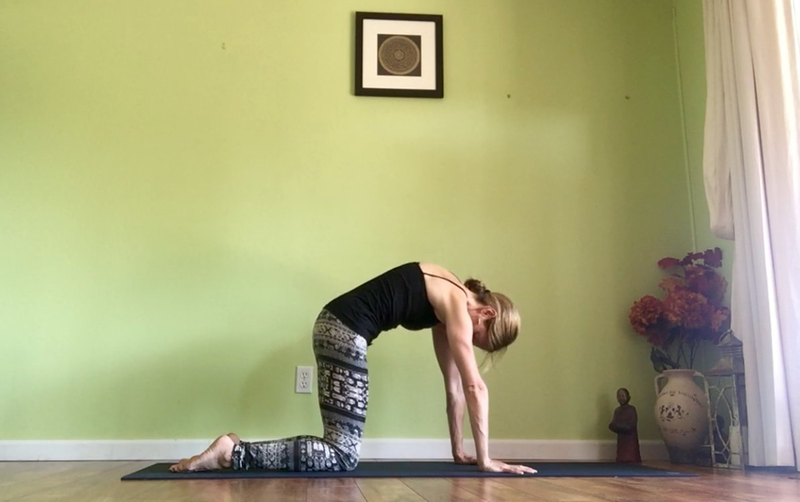 Take a deep exhale as you tuck the tailbone, roll through the spine, round the back, draw the belly up towards the spine and draw the chin to chest, into Cat Pose. Repeat 5 rounds, using the breath as you inhale to Cow pose and exhale to Cat pose. 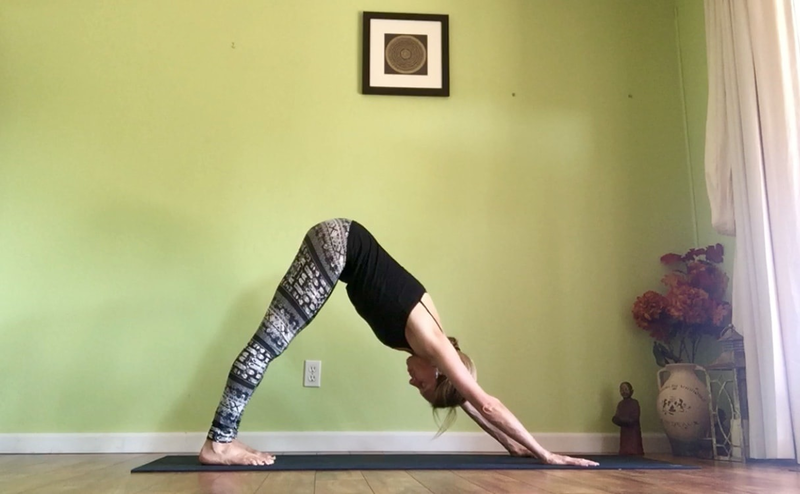 From Cat and Cow, tuck the toes under, lift the hips up high, into Downward Facing Dog, an upside down V shape. Spread the fingers wide, pressing into all 10 fingers, particularly the thumb and first finger. Place your hands a little wider than shoulder width, and feet about hip width. 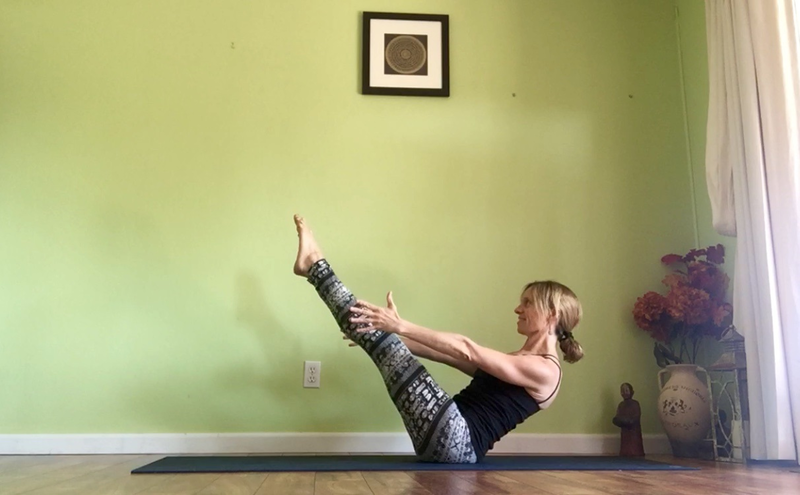 Press the heels to the mat as you lift the kneecaps to engage the quadriceps, draw the belly up towards the spine to engage the core, press the sit bones up towards the sky, push the floor away with the palms and draw the heart towards the thighs. Hold and breathe for 5 long deep breaths. Lower the knees to the sides of the mat, place the big toes together, sink the hips back into the heels and place the forehead on the mat for Child's Pose. Your arms can be stretched out in front or back alongside the legs, whichever feels most comfortable for you. Hold and breathe for 5 long deep breaths. Lower down onto your belly, place your hands underneath your shoulders on the mat, as you inhale press into your hands and lift your chest and head up off the mat, keeping your hips and legs low. Keep a small bend in your arms, roll your shoulders down away from your ears, draw your shoulder blades together and open across the chest. Hold and breathe for 5 long deep breaths, relaxing the low back and breathing into your low back. Lower back down onto your belly and take a Child's Pose to release the low back. From standing, step the left foot back about 3 feet, turning the foot in about 60 degrees, keeping both legs straight, and front foot facing forwards. Extend the right arm forward over the right leg and the left arm back over the back leg. 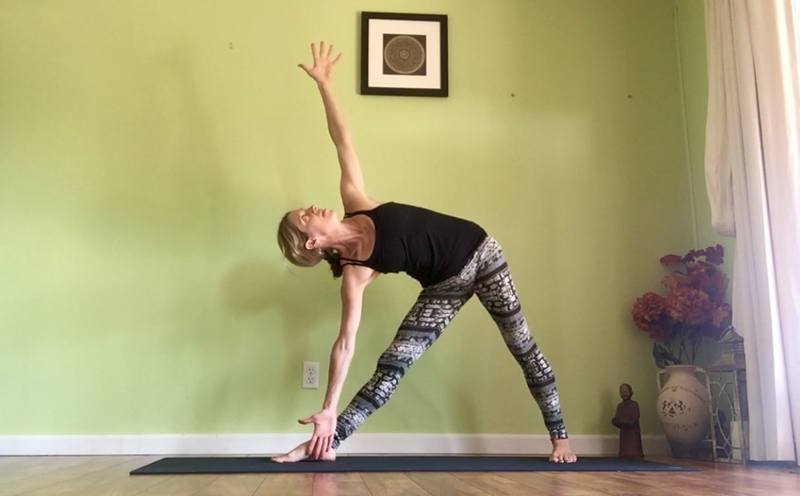 As you inhale lean the right arm forward lengthening the right side body, as you exhale lower the right hand to the inside of the right shin, and extend the left arm up towards the sky, spreading the fingers wide, into Triangle Pose. Press the feet firmly into the mat, microbend the front knee if you need to prevent from hyperextending, take the gaze up to the left thumb if feels ok for your neck, draw the left hip and left shoulder back. Hold and breathe for 5 long deep breaths. Repeat on the other side, stepping the right foot back. From standing, step the left foot back about 3 feet, turning both feet in slightly so you're a little pigeon toed. Press into the outside of the feet. 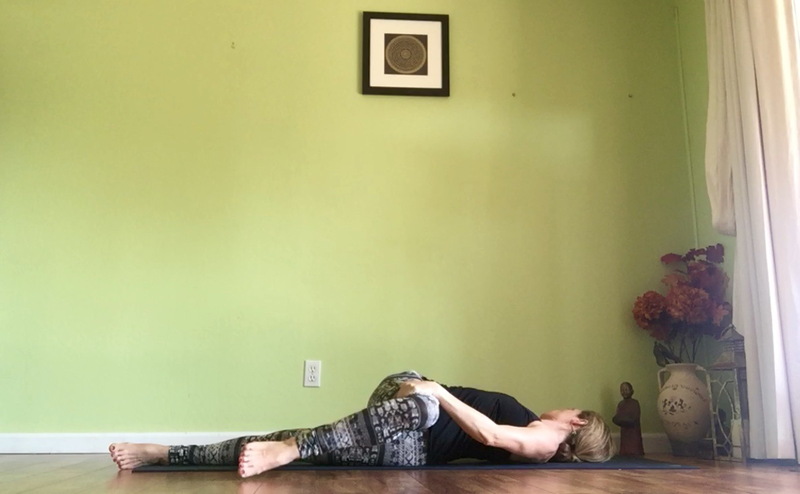 Place the hands on the low back, inhale take a small lean back as you lengthen the spine, exhale as you fold forward from the hip crease, lowering the head towards the mat. Let the hands come down to the mat in between the feet, or you can place the hands on the outside of the feet and use the strength of the arms to fold a little deeper. Try to keep the legs straight if you can or you can soften the knees a little to modify. Hold and breathe for 5 long deep breaths. 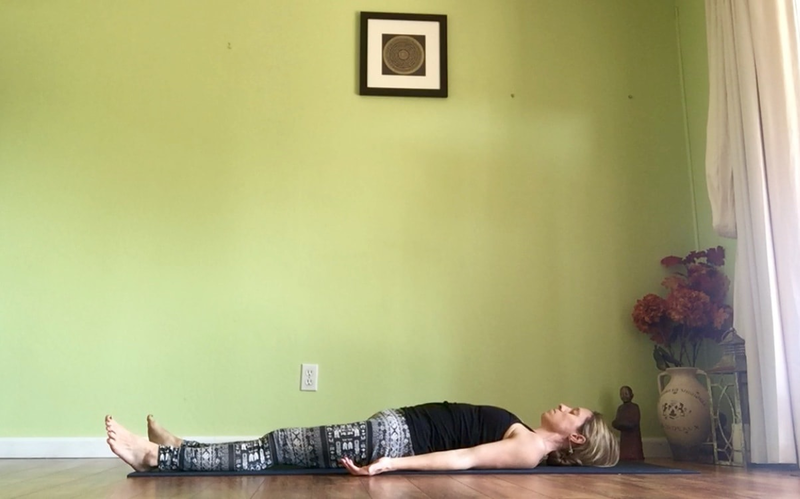 From standing, place the feet a little wider than hip width apart, feet pointing out, sink the hips down, keeping the spine long and tall, reaching the crown of the head up, shoulders relaxed and the heart open, and bring the palms to the heart center. Use the elbows or triceps to gently press the inner thighs outwards. Hold and breathe for 5 long deep breaths. From hands and knees, place your left shin forward on the mat so the left foot is behind the right hand and the left knee behind the left hand, extend the right leg out behind you with the top of the leg flat on the mat. You can place a block underneath your left hip if the hips are not level or if your left hip is not touching the mat. 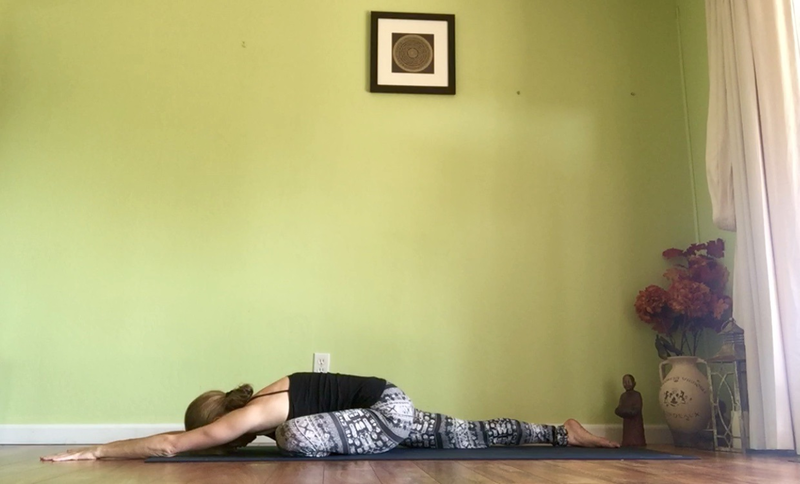 Inhale as you lengthen the spine, exhale as you fold forward over the left shin, keeping the spine long and resting the forehead on the mat, on a block or on folded arms. Soften the shoulders down. Hold and breathe for 5 long deep breaths. Repeat on the other side, with the right shin forward. From seated position, sit up on your sits bones, with your spine long, shoulders relaxed away from your ears, lift your legs up, engage your lower core muscles and begin to straighten your legs if that's available or you can your legs bent. Make sure your low back is flat and not rounding down towards the mat. Keep your core engaged and strong by drawing the belly back towards the spine. You can keep the hands on the back of the thighs as a modification or more advanced to extend the arms out on either side of the legs. Hold and breathe for 5 long deep breaths. From lying on your back, draw the knees into the chest, extend the arms out in a T on the mat and lower both knees over to your left as you take your gaze over your right shoulder. Place your left hand on the outside of your right thigh to deepen into the twist. Hold and breathe for 5 long deep breaths. Repeat on the other side. Lying on your back, bend your knees, let your feet and knees be wider than hip width, place your hands on the soles of the feet and press the feet and knees down towards the mat. Hold and breathe for 5 long deep breaths. Lying on your back, close your eyes, let the whole body be relaxed and still, arms a little away from the body, with the palms facing up. Bring your internal gaze to your third eye chakra in between your eyebrows and visualize a bright white light at that space, area of intuition and wisdom. Remain here in Savasana for a few minutes or as long as you wish, before slowly and gently deepening your breath, finding some movement back in your body, rolling onto your right side then slowly coming into a seated position. Bring your palms together at your heart center. Namaste. I'm going to be writing more articles teaching correct yoga pose alignment, particularly to address specific issues, as well as creating videos (coming soon). I'd love to hear what challenges you have so I can provide you with articles and videos that you would like to read, view and follow. Submit your challenges below. Feel free to also leave any feedback and questions you have in the comments section below, and share on social media if you found this article helpful. Do you have pain or tension in your shoulders? Sitting at a computer or desk for hours.